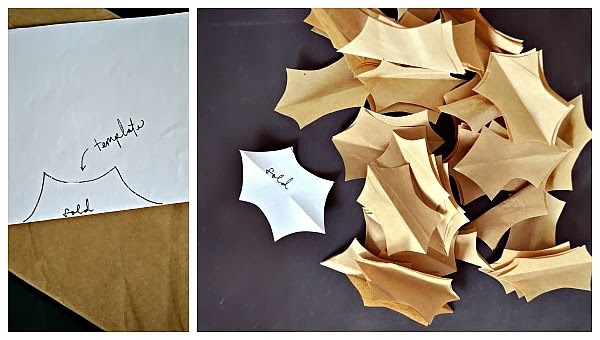 Here's a quick idea for gift wrapping, especially if you made one of the previous projects using the cut-out holly leaves and you happen to have a few extra leaves left-over! 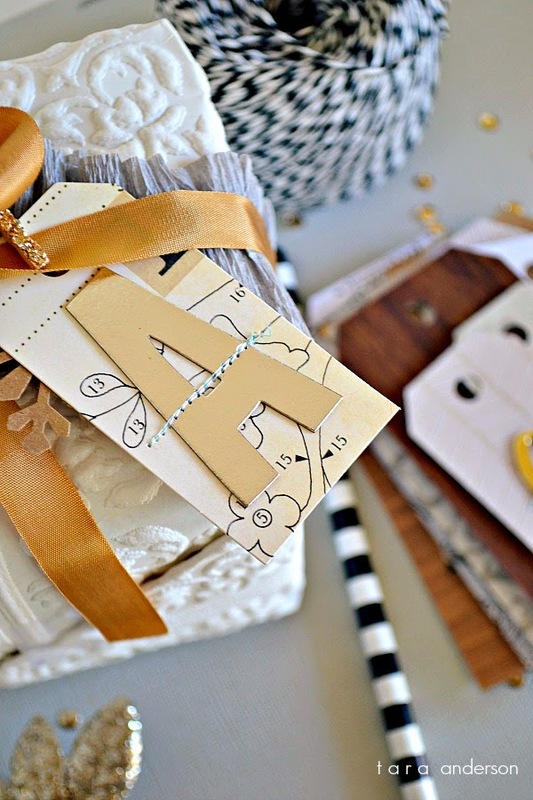 When it comes to gift wrapping, I love layering! 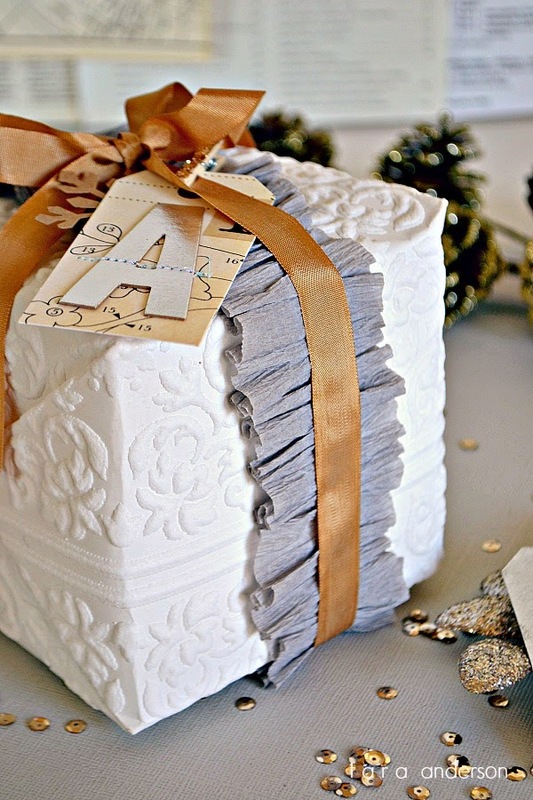 It's my secret weapon to making my gifts look presentable. 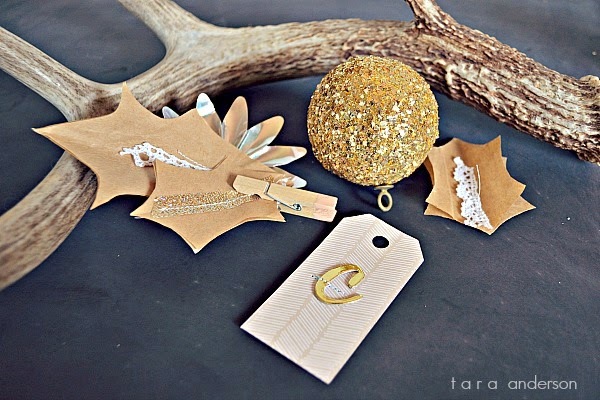 I'll layer, ribbons, bows, leaves or flowers, gift tags and everything gets clipped together with a little clothespin. I have a to-do list a mile long today! It may be a tad overly ambitious for a single days work, but I'm going for it - and, with a little luck, I'll hopefully have a new tutorial and giveaway to post this weekend. 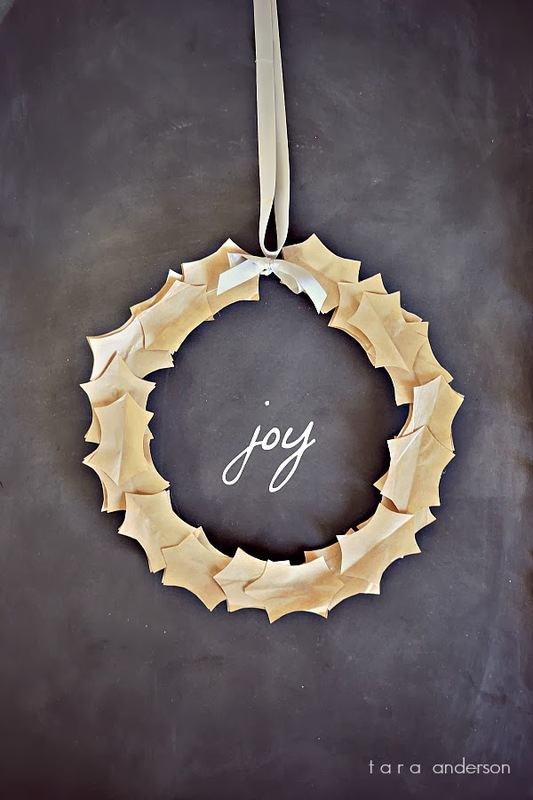 Make a simple & pretty holiday wreath with just a few paper leaves and a coat hanger! 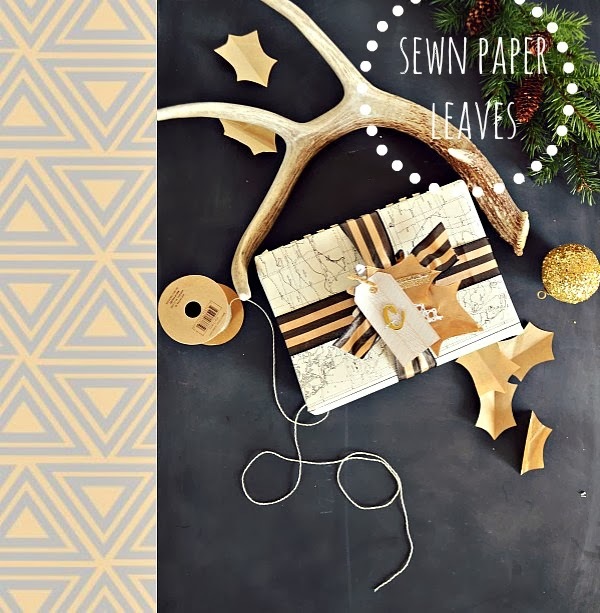 Just like yesterdays project, we'll use similar products as well as the technique to make a really simple wreath to hang up this holiday season! You'll need to create a holly leaf template. (Search online for a printable one, or just draw one, like I did, onto a folded piece of paper.) Cut out leaves from paper, I used about 40 leaves total for my wreath. 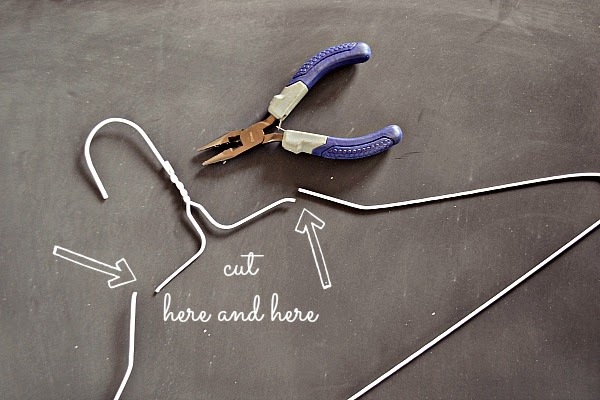 Use a pair of wire cutters to cut the top part of the hanger off. 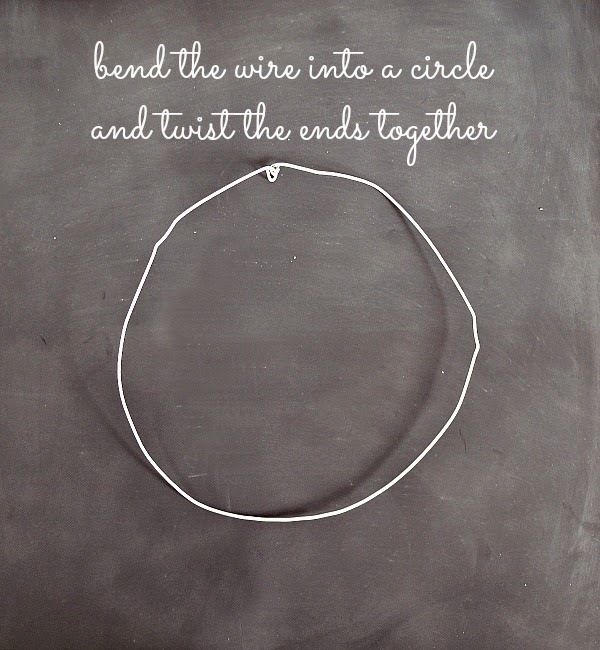 Carefully bend the wire into a circle and use pliers to twist the end pieces together. Start to glue the leaves on to the wire. Add a leaf to the back of the wire, add glue and then place a leaf over the wire and on top of the first leaf. 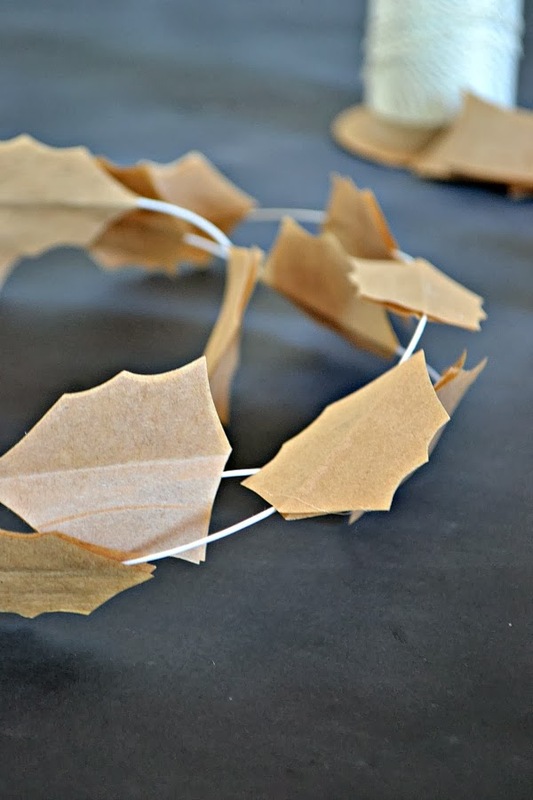 You'll want to cover the wire completely with paper leaves. 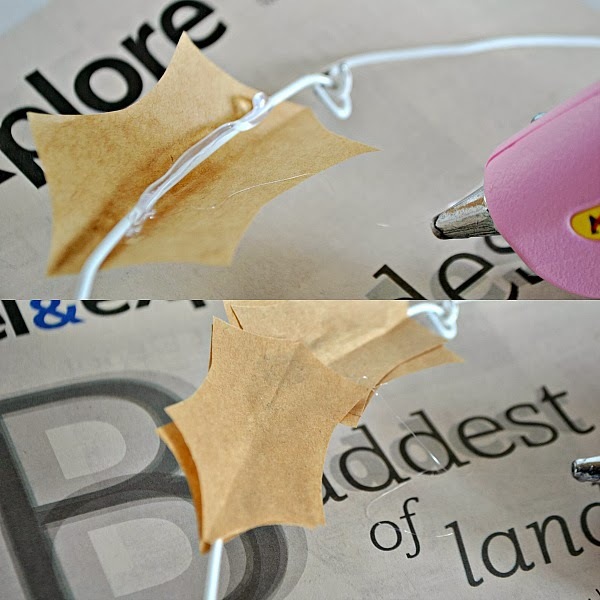 Once you've finished gluing the leaves onto the hanger, let the glue dry completely and then you can remove all of the glue strings. 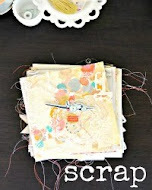 (I love using hot glue, but really dislike all those glue spider web strings that end up being left over!) 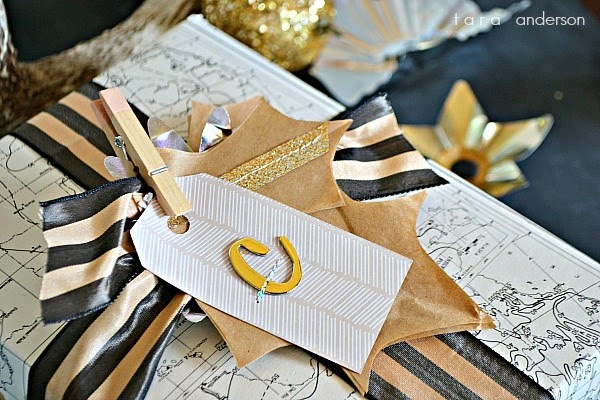 Create a bow using string or ribbon to hang up and your paper wreath is complete! 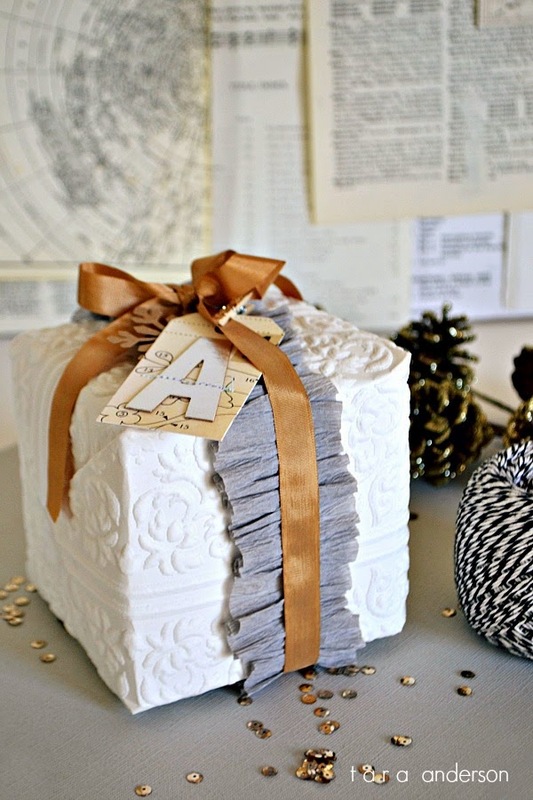 I have another gift wrap idea to do with the same holly leaves, and then I want to do something with snow globes! Everyone loves snow-globes this time of year! 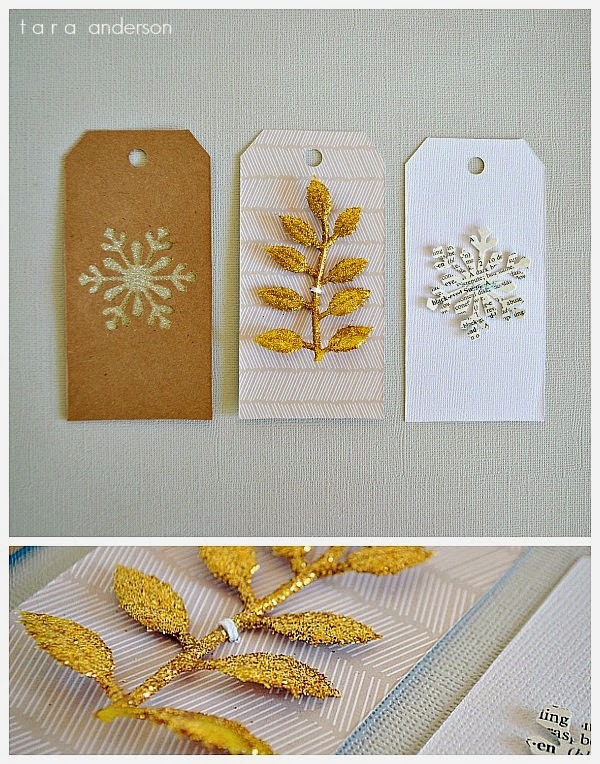 Holly leaves, like snowflakes, are one of my favorite holiday embellishments to use! 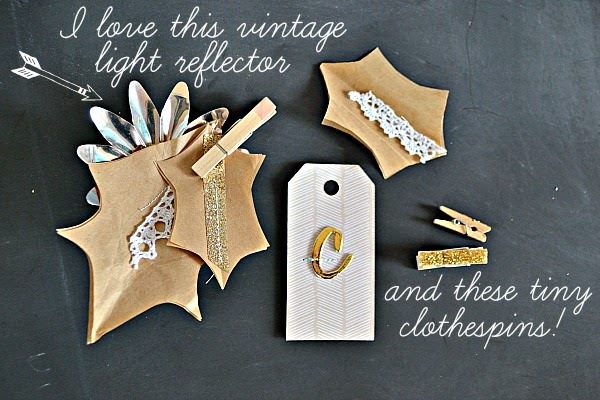 I've created a few quick diy projects that make the most of these little paper leaves! 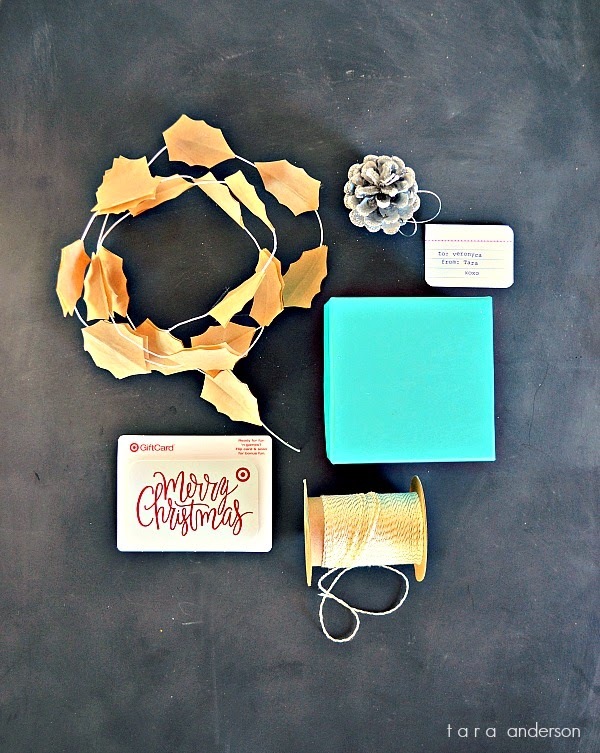 Here's my simple how to: on making a holly garland that you can use for decor or even giftwrapping! 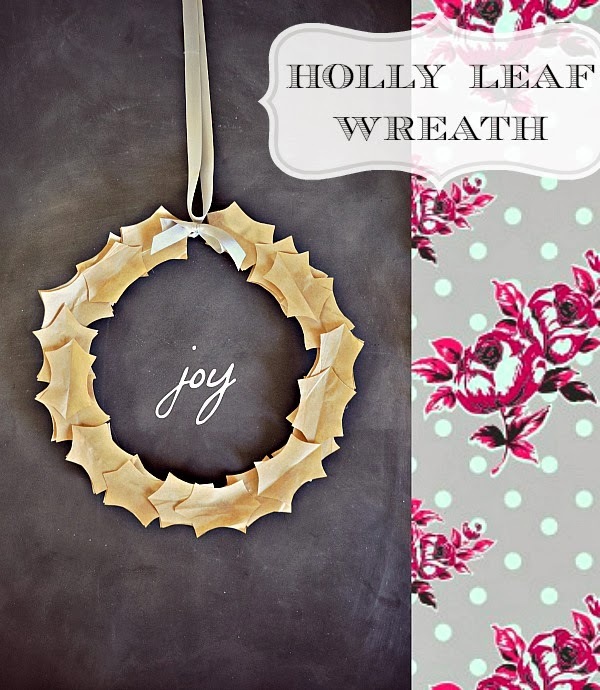 First to get started, you'll need to create a template of a holly leaf by either going on line and finding one or by creating one by freehand. Last week I needed to get some painting done and Chase and I made a quick run over to Home Depot to pick up a few supplies when I came across this kraft like paper. It's called Eco Drop, it's actually a paper dropcloth for painting but it's comparable to a thin kraft paper. Plus it's eco friendly and recyclable - the best of both worlds! I paid about $4.00 for 216 square feet. 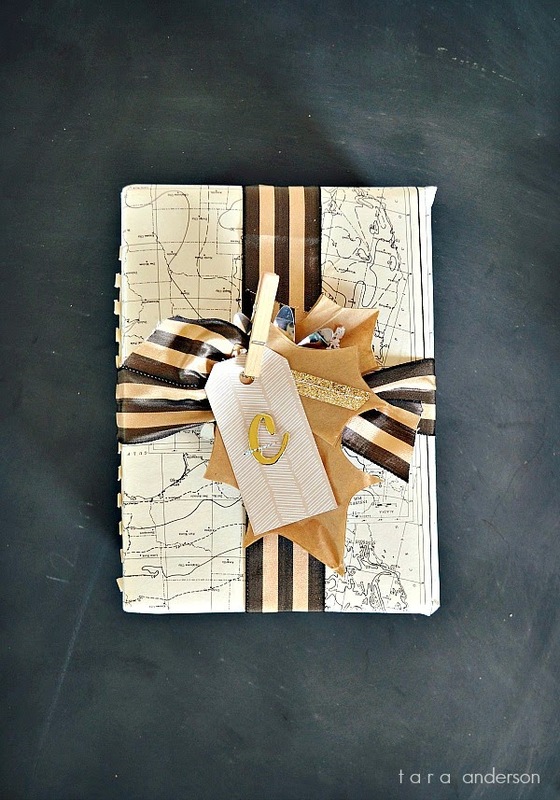 I'm also planning on using it to wrap presents this year, just dressed up a bit with bows and other pretty embellishments! 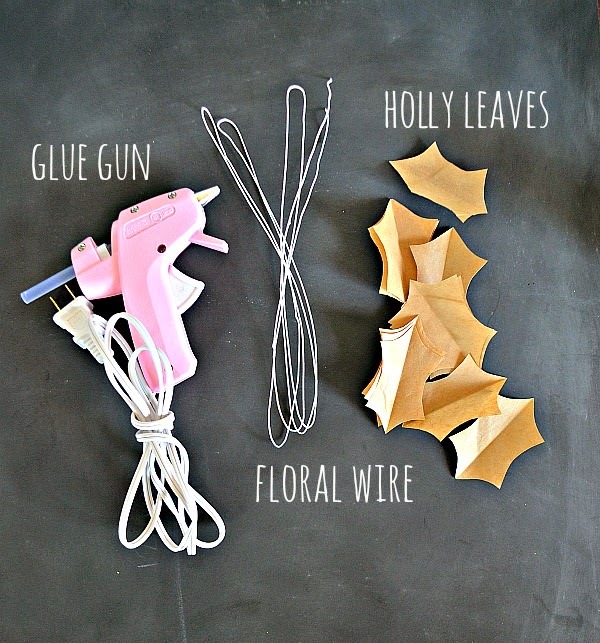 You'll also need; a glue gun, glue sticks, some craft or floral wire (mine was really thin and easy to bend) and cut holly leaves. 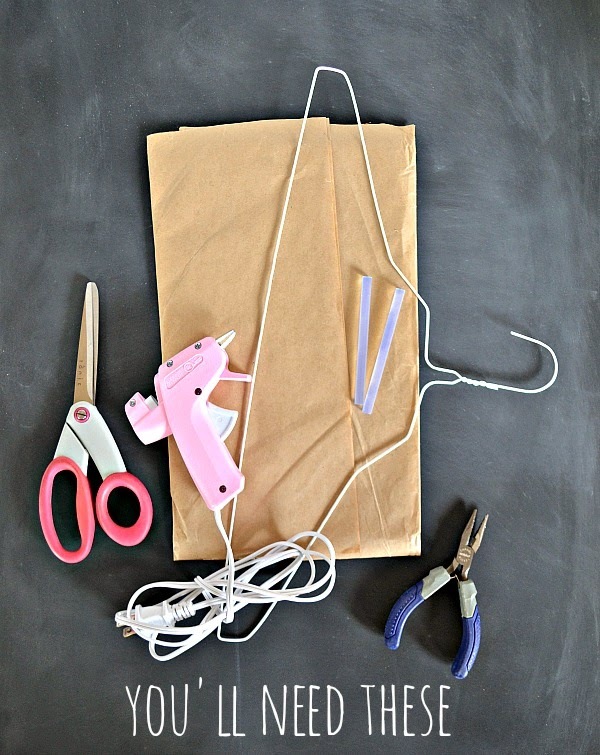 Start by spreading out newspaper under your glue gun, to keep your work space safe, and letting the glue gun heat up. Stretch out the wire and lay out flat. 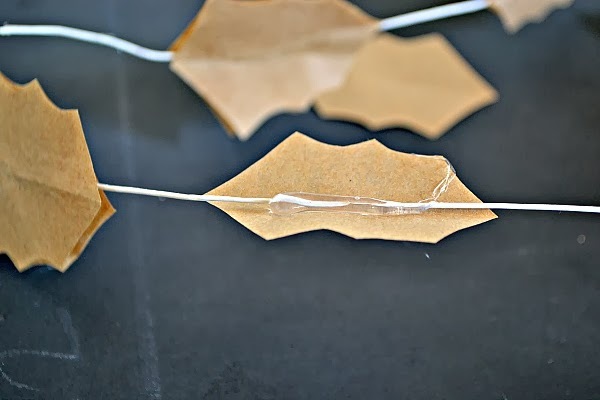 Place a paper leaf under the wire, add a bit of glue and sandwich another leaf on top. I left about an inch space in between each leaf. 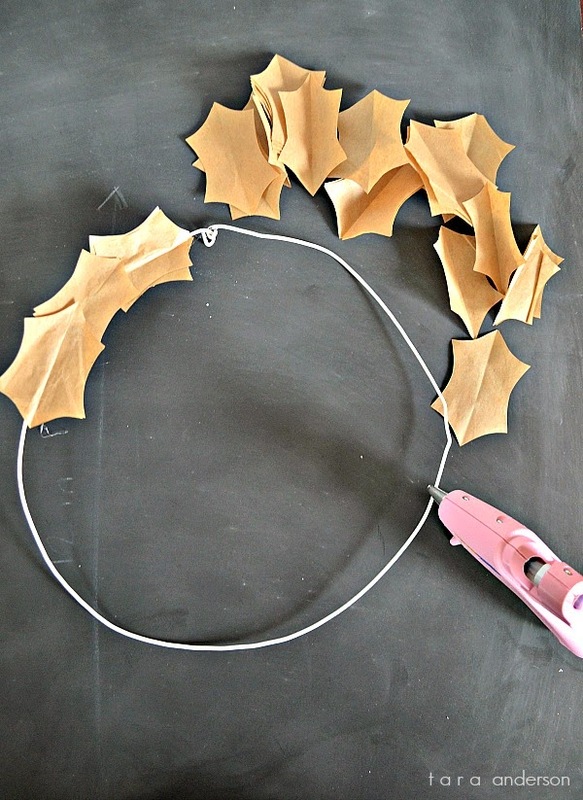 Continue gluing leaves to the entire length of the wire. Once you finish gluing the leaves on, you can hang your wired garland up as a holiday decoration or use it as part of you gift wrap decor! 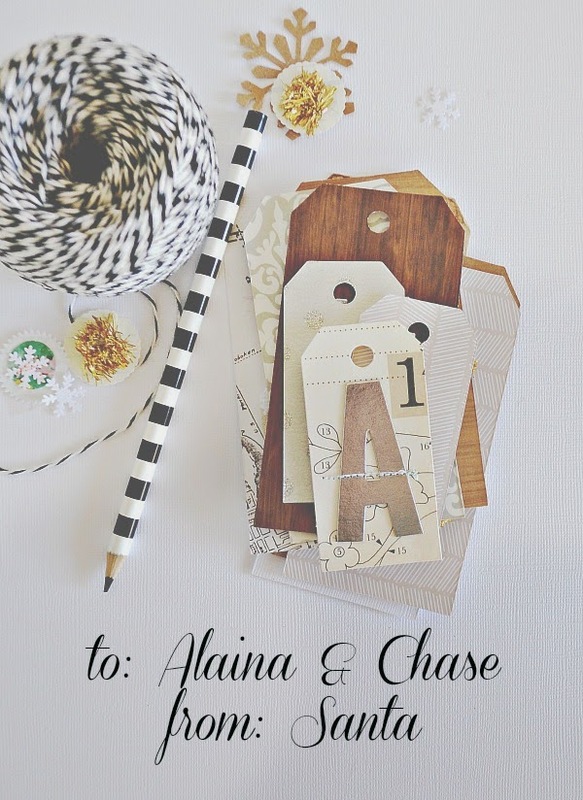 Here's how I used it to wrap up a simple gift card! 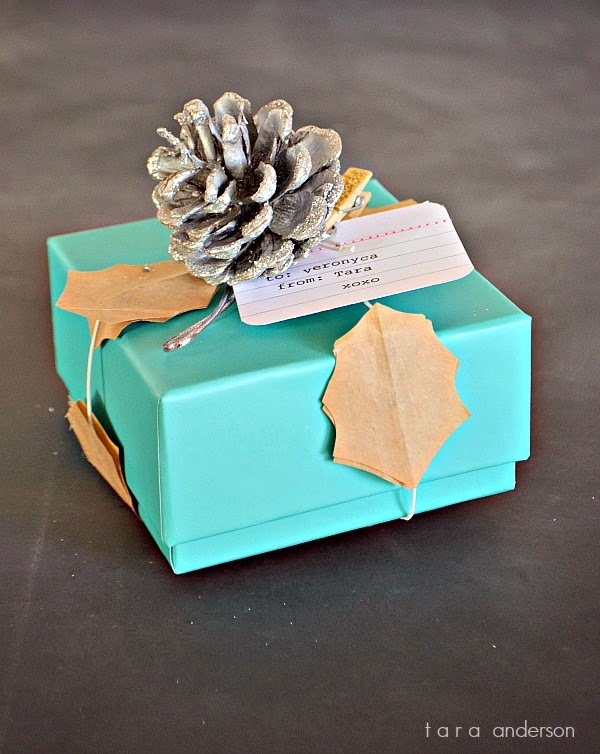 I stared with a little teal box, a gift card, glittered pine cone, holly garland, a small typed tag and some string or a clothespin. 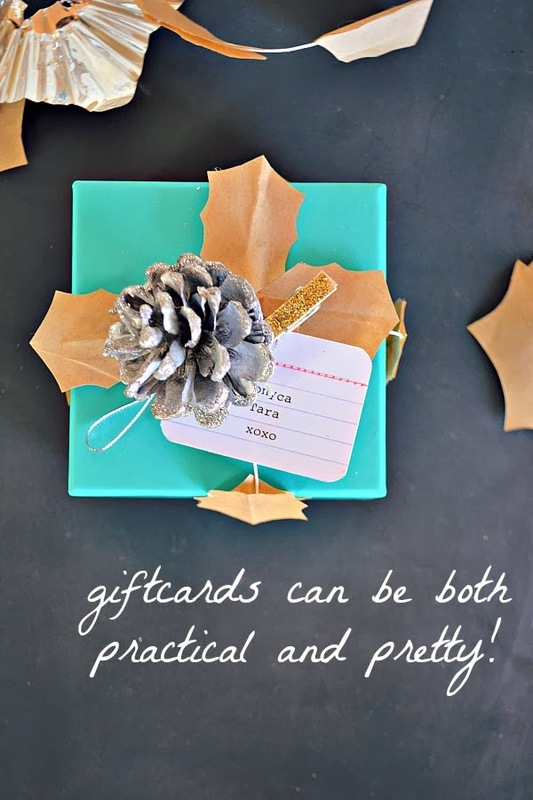 Tuck the giftcard into the box, wrap the garland around the box, snipping off the extra and twisting the wire together to hold in place. 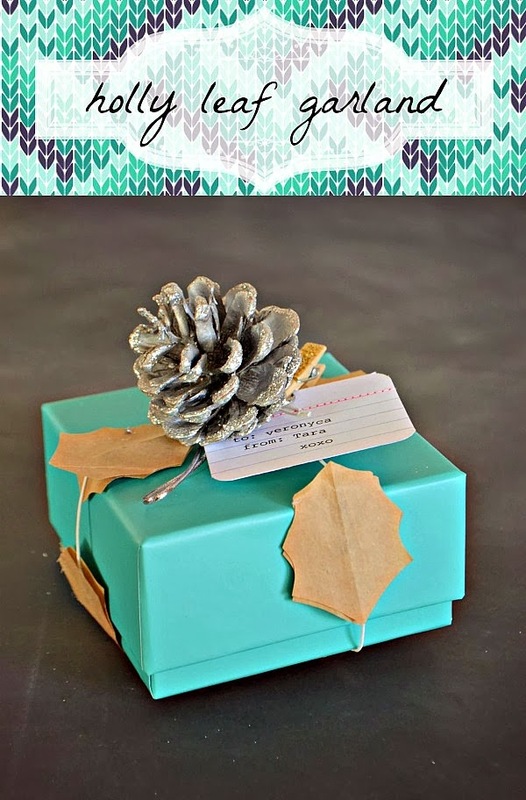 I used a clothes pin to hold the gift tag and pinecone in place, just clip to the wire garland - you could also use the string to tie everything together. It's a pretty presentation for a small gift! I have another 2 projects using the same leaves that I'll post a little later today. 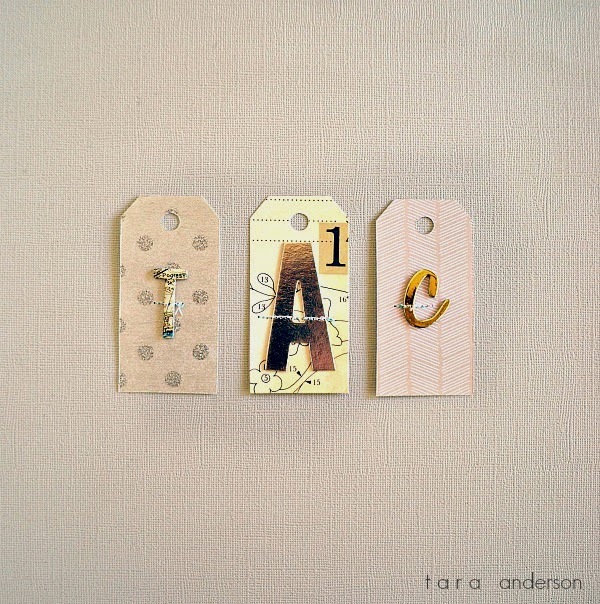 I'm off to get some Etsy stuff done this afternoon and then back to crafting! Enjoy your Wednesday! It's easy, with all the hustle & bustle going on around us, to forget about the little details of the holiday. 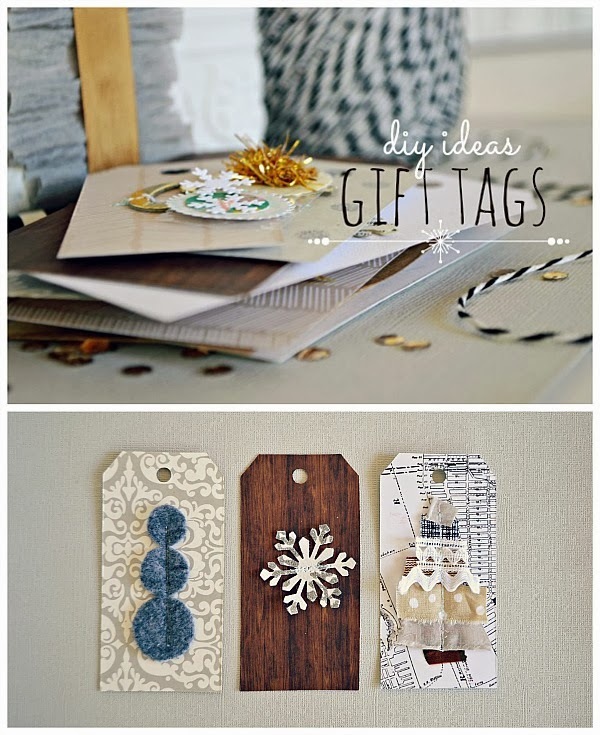 Things like gift tags! 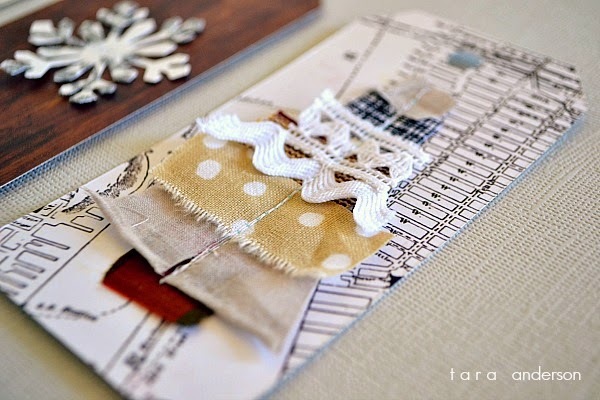 You wrap a gift, make it as pretty as possible and then remember that you don't have a gift tag to attach! 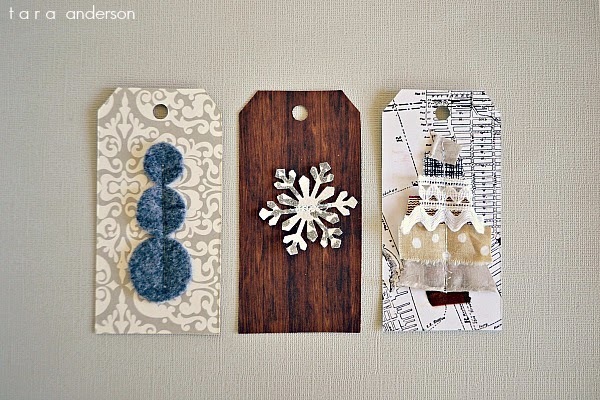 Here are 6 simple gift tags that you can probably make with just the random craft items sitting on your desk right now! I have a clove and chestnut candle burning, The Holiday playing on tv and the living room is lit with the soft light of a glowing white Christmas tree. Let the season begin! - play the "Mystery Holiday Words" game. Think of a holiday word, then give out 3 clues to what your word is. (We play this game alot while driving & running errands) It's fun and passes the time by quickly! I've been creating a list of tutorials I want to do this month but first, I need to get this house decorated. We've decided on a silver and gold theme for the house and the kids' tree will be a red & pink candy/dessert tree this year. So many fun things to do this season! 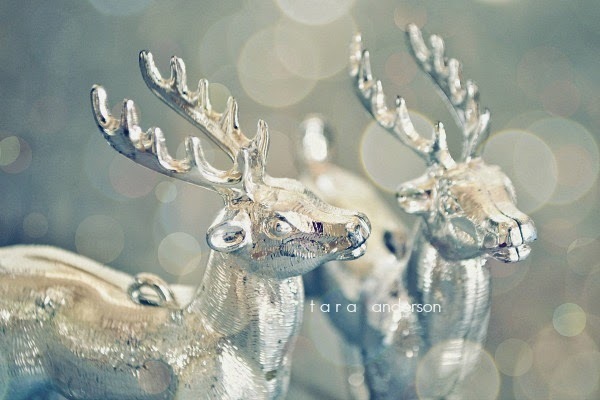 Goodnight and Happy December 1st!